We are very pleased to welcome Dr. Hudson to the All Cats & Dogs family! Dr. Hudson is a 2010 graduate of Western Kentucky University and a 2014 graduate of Auburn University’s College of Veterinary Medicine. After Dr. Hudson’s graduation from Auburn University, she was offered a position at a veterinary practice in Hawaii. Dr. Hudson spent a year at The Cat Clinic (located in Honolulu) before moving on to the Kailua Animal Clinic (located in Kailua) where she spent 2 years. While Dr. Hudson enjoys all aspects of veterinary medicine, she is most interested in feline medicine and surgery. When not working, Dr. Hudson enjoys kayaking, paddle-boarding, snorkeling, and spending time with her husband, Brian, and their four pets. Dr. Thorne has been practicing veterinary medicine for over 30years, having received her Doctor of Veterinary Medicine degree from Auburn University, College of Veterinary Medicine in 1983, after completing a bachelor’s degree in biology and agriculture from Western Kentucky University in 1979. She is a native of Bowling Green, and happy to have returned. Dr. Thorne has a strong interest in feline preventative health, behavior, and the human animal bond, recognizing the importance of having a pet in human health. She is a member of the American Veterinary Medical Association (AVMA), Kentucky Veterinary Medical Association (KVMA), Veterinary Information Network (VIN) and the American Association of Feline Practitioners (AAFP). Dr. Thorne has been awarded the Distinguished Service Award and Veterinarian of the Year by the Alabama Veterinary Medical Association for her work with the Veterinary Wellness Committee. In addition to horseback riding, gardening and quilting, Dr. Thorne enjoys travel and her two children– Beth, a practicing Veterinarian who recently joined our practice, and Chris, a former U.S. Marine who was stationed in Hawaii but who now attends Auburn University studying Pharmacy. Dr. Thorne loves to trail ride with her horse Willie. Beverly grew up on a farm in Logan county where she had many different types of animals including dogs, cats, pigs, a skunk and even a baby alligator! Her love for animals has continued throughout the years. In her spare time she enjoys reading and spending time with family and friends. We’re excited to welcome Anne Partlow to the All Cats & Dogs Veterinary team! Anne is a Kentucky transplant by way of Virginia Beach and is currently studying to become a veterinary assistant. When Anne isn’t studying or working she can usually be found stomping grapes at her family’s vineyard in Russellville or hanging out with the menagerie of pets she shares her home with, which includes six cats, 4 dogs, one rabbit, a donkey, and a cow. Jordan was born and raised right here in Bowling Green, KY where she also attended WKU. 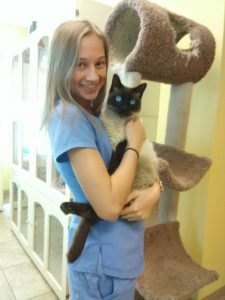 After graduating with a Bachelor of Science in Biology she worked in Florida as a veterinary assistant before settling back in the Bluegrass State. Jordan is the proud pet parent of a cat named Hardrock and dog named Finley. Outside of work, Jordan is an avid athlete and enjoys cycling, running, and competing in triathlons.